I love this film! It was probably the very first SI film I ever bought back in the days before I had any idea about the industry. I watched Bhool Bhulaiyaa in the cinema and then read that the dancing was better in the original movie, so immediately hunted down a copy. And really, it’s not only the dancing that is better! Manichitrathazhu was released in 1993 and has since been remade in a number of different versions but of the three I have seen, the original is definitely the best. In contrast to the more comedy orientated Bhool Bhulaiyaa, Manichitrathazhu actually works well as a ghost story with some genuinely eerie scenes and unexplained happenings to set up the story. Nakulan (Suresh Gopi) and his wife Ganga(Shobana) move in to his ancestral home, Madampilli house to live for a few months while Nakulan works in the area. The house is reputedly haunted by the vengeful ghost of a Tamil dancer Nagavalli and that of her murderer, the rich nobleman Sankaran Thampi. Their spirits are said to be held in a room of the mansion and the door is locked shut with the ‘ornate lock’ of the title. Ganga and Nakulan both disbelieve totally in such fanciful ideas, but Ganga is fascinated by the story of the doomed dancer and with the help of Nakulan’s cousin Alli (Rudra) she contrives to open the room. To my disappointment, and possibly hers as well, no vengeful spirits rush out, and she only finds the dust of ages and a box of Nagavalli’s jewellery. Once the door is opened however there are a number of strange happenings around the mansion. Various articles catch fire and the sound of ghungroos and music are heard at night. The head of the family Thampi (Nedumudi Venu) and his bumbling brother Unnithan (Innocent) move their families into the house to try to protect the couple as well as attempt to confine the spirits back to their room. This part of the film is captivating with the juxtaposition between science and superstition and the various ways the family deals with the apparent ghostly manifestations. On the one hand Thampi and his family tie charms to ward off evil spirits, employ priests to hold ceremonies and engage a tantric expert to pacify the spirits, while Nakulan steadfastly refuses to believe in any supernatural entity and calls in his friend and renowned psychiatrist Dr Sunny Joseph (Mohanlal). Although from Dr Joseph’s introduction it’s hard to know which of the two methods is the better choice. Nakulan suspects his ex-fiancée, Thampi’s eldest daughter Sreedevi, of causing all the incidents around the house. Sreedevi is a quiet and withdrawn girl who apparently has an unfortunate horoscope and who also seems to turn up at the wrong place every time something strange happens. With the arrival of Dr Joseph the story shifts from the supernatural into more of a psychological thriller as the psychiatrist does not believe in the existence of a supernatural entity either and decides that there is a mentally disturbed human agency behind the disruptions. Dr Joseph goes about tracking down the culprit with his unique methods, and then has to deal with the consequences of his discovery. The only thing I don’t like about this film is the character of Dr Joseph despite Mohanlal’s best efforts and terrible shirts. I find that the over-the-top comedy aspect detracts from the more serious side of the story when it starts to delve into the issues of mental illness, and a lot of the antics Dr Joseph engages in are just irritating. However it’s not supposed to be an exploration of mental illness and I don’t find the attitudes of the other characters annoying in the same way. The patronising and condescending manner of Dr Joseph in his ‘comedy moments’ is horrible though and I don’t like way his character sleazily tries to woo Sreedevi at the same time as’ accusing’ her of mental illness. And yet, when the action takes over and the jokes stop, Dr Joseph is much more likeable and I wish that Mohanlal had played him as a straighter character for the whole film. Shobana on the other hand is amazing as Ganga. She plays the character so well and thoroughly deserved the awards she won for her performance. Vinaya Prasad as Sreedevi doesn’t get as much screen time but she plays the quiet and unassuming character with the appropriate dignity and reserve. The two uncles Thampi and Unnithan together form a ‘comedy-light’ track and it’s generally well done and fits into the story without detracting from the main action. However the comedy track involving the tantric expert Brahmadattan Nampoothirippadu (Thilakan) is a little too slapstick for my taste and just isn’t very funny. Suresh Gopi is fine as the rather utilitarian husband dealing with the unexplained happenings in his ancestral home, but he is frequently overshadowed by Shobana and Mohanlal. The other minor characters are all good in their roles and I really like the actress who plays Unnithan’s wife. She had some great comedy moments and was very natural in her role. I haven’t said much about the dancing which was the whole point of watching this film initially, but the highlight is the final climax song. It does give away the identity of Nagavalli though so skip it if you don’t want to know. Otherwise click here for the best depiction of Nagavalli I’ve seen. The whole sound track by M. G. Radhakrishnan is lovely too and this is another beautiful and moving song from the film. As seems to be the case with most Malayalam films, no matter what the subject matter, the film looks beautiful. The house used for the shoot appears to be a labyrinth and the various characters often have to run up and down stairs, along corridors and through innumerable doors to get to the scene of the action. Nothing ever seems to be shot against a blank wall, but instead is filmed against doorways, windows or beautiful shots of the country side. While no actual ghost is seen, there are shadows and suggestions all made more chilling by the use of claustrophobic corridors and shapes glimpsed through far doorways. The décor of the house is also well thought out with the couple’s room having the feel of one where the occupants are only there for a short time. And of course I also noticed the clocks. 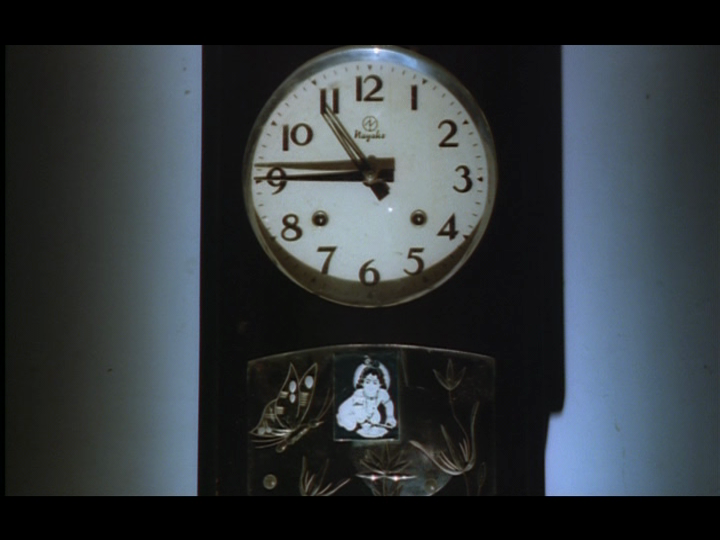 I really like ghost stories, and Indian cinema has some good examples of spooky, understated and haunting (ha!) films. 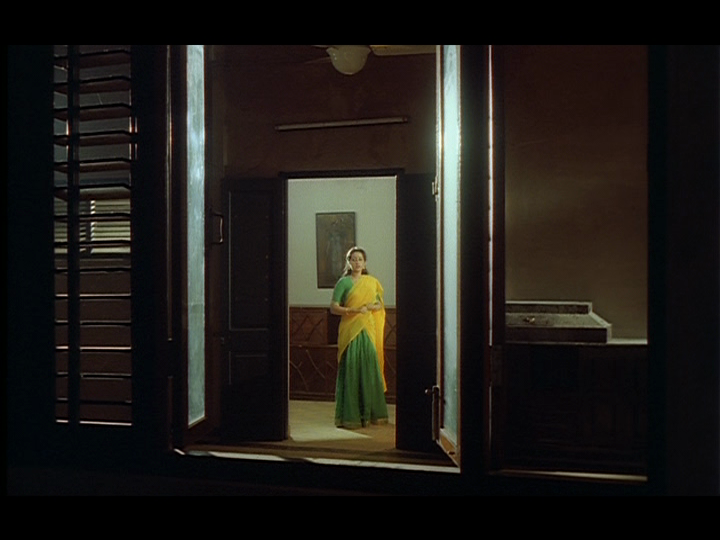 I like a lot about Manichitrathazhu, and totally agree with Heather on the beauty of the house and location that add so much to the atmosphere, and the excellent dancing in the denouement. Shobana is a compelling and beautiful heroine, and gives Ganga a great deal of emotional depth and energy. There is much more to Ganga than the dutiful wife who mutely follows her husband’s lead, and Shobana brings her to life. But Mohanlal really spoils it for me. I disliked his characteriation of Sunny Joseph on first sight and thought he failed miserably to balance the unconventional prankster with the more serious practitioner and friend. Watching it again, and knowing how it ends, there is no suspense left to distract from the shortcomings of how things happen. This may be considered sacrilege but if I could play mix’n’match, I would replace Mohanlal with Rajnikanth (in the Tamil version, Chandramukhi) who at least has enough charisma to overcome a fairly silly character. And I would probably want Vidya Balan (Bhool Bulaiyaa) or Anushka Shetty (Nagavalli, the Telugu sequel to Chandramukhi) in the supporting cast with Vinaya Prasad as long as they left the dancing to Shobana! I initially watched the film on the strength of one dance sequence and that is still the most memorable element for me. The songs from the Tamil and Hindi versions are also worth a look even if you don’t fancy the whole film, especially the final classical styled songs that feature Vineeth. Manichitrathazhu is a pretty looking film, has some excellent atmospheric scenes (although it never caused me the slightest goosebump), and the soundtrack is pleasant. I recommend watching it, but unlike Heather I don’t think it stands repeat viewings unless you have a serious interior design fetish, a very poor memory or a very high tolerance for Dr Sunny. 3 1/2 stars. This entry was posted in Mollywood and tagged Fazil, Innocent, M. G. Radhakrishnan, Madhu Muttam, Malayalam, Manichitrathazhu, Mohanlal, Nedumudi Venu, Rudra, Shobana, Suresh Gopi, Thilakan, Vinaya Prasad. Bookmark the permalink. Don’t think of Mohanlal as a below par actor.. This maybe the malayalee in me speaking.. If you are to judge the acting of Mohanlal.. Try watching movies like Iruvar, Kireedam, Pavithram, Dasharadham, Thoovanathumbikal.. or even his recent movies like Bharamaram or Pranayam.. This is not some kind of a word war.. Thanks as well for your list of Mohanlal films – more to add to the ever growing list of films to watch! Hey guys great review! I have to disagree with your comments about Mohanlal though. I thought Dr. Sunny was just a quirky character and greatly enjoyed his pranks/jokes. All the songs in the movie are done in a certain scale that is considered forbidden by classical music teachers. Apparently they never teach that raaga to their students as it is considered to be asssociated with evil spirits. This movie was just really fascinating for me to watch and I never get tired of watching it! I’ve watched this film around 6 or 7 times and love it! Thanks for the information about the music – it is very haunting and just lovely. When I first heard the song Oru Murai Vanthu I had it on repeat for months 🙂 and it’s still a song I play frequently. I’m sure I did get that he’s supposed to be eccentric – after all he’s a psychiatrist! But unfortunately that’s not how the character comes across to me. I certainly don’t think doctors have to be serious – not at all, but I find the comedy doesn’t work here and I don’t find it funny. I think Mohanlal is a fantastic actor but this is not my favourite character of his. Then again I didn’t like this character in any of the versions of the film I have seen either, so pretty sure it’s nothing to do with the actor and all about the characterisation. I also don’t find American humour funny and I know that many Australians are baffled by the things I do find funny – Irish humour is pretty dark! The rest of the soundtrack is really worth listening to as well if you liked these two songs, as I think it is really very beautiful. Did you guys know that Shobana is the niece of the dancing trio Lalita, Padmini, Raagini of the South Indian Cinema in older days? The song was fantastic. Acting-wise, I didn’t really expect Shobana to beat Jyotika based on her Telugu movies. The dance clip was an eye-opener. Thanks! This is an very impressive review indeed. I remember having seen this movie as a kid and remember not being able to doze for days. I find the reference to Mohanlal’s acting a bit too harsh. There are times in the movie where he does show his finesse as an actor, especially towards the latter part of the movie. But agreeably one of the epic movies to come out of the malayalam stables. And glad to know it has found an following among people from everywhere. There are a few more classics in malayalam which are worth a mention here too. Lookin forward to more reviews from India. 100% agree about Shobana – brilliant performance from her and the best out of all the versions I’ve seen. Which Malayalam classics would you recommend? I’m always looking for new films to watch. Thanks for your comment 🙂 Comedy is definitely the hardest to understand and since I’m not a fan of this type of slap-stick humour in any language I find it hard to relate to Sunny’s character. That said, I still do love the film and it’s my favourite version out of all three that I’ve seen. 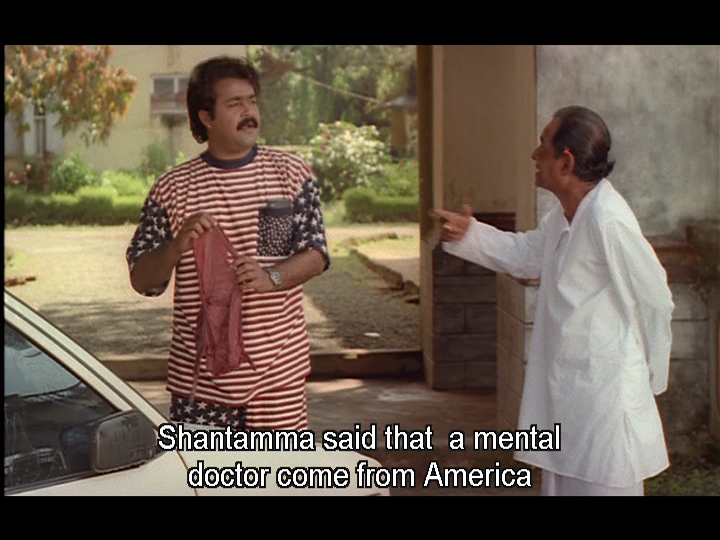 I completely disagree with the comment that Mohanlal as Dr.Sunny was irritating. That character is funny and light-hearted and Mohanlal has done a perfect performance in that role. But as I’ve mentioned before, both are much less irritating than Akshay Kumar’s Dr Aditya in Bhool Bhulaiyaa! Where do I find this movie with english subtitles?? I bought this DVD from AnyTamil who unfortunately aren’t around any more. But you could try http://www.malayalamflix.com who do have a good range of Malayalam films with subtitles and are happy to try and find a film if they don’t have it in stock. I hope you find a copy – it’s a great film! Thankyou, they have it w eng sub, but I live in Norway, so I think it will be very expencive…. I haven’t seen it online with subs anywhere. if i find any subtitled downloadable link i will let you know or did you see the movie? Lucia schanke, try to look on YT. There was a whole movie with built -in subtitles. It was difficult to find a copy of this version with English subtitles when I first bought it a few years ago! Great review about the movie, it is indeed one of the best movies made in malayalam. I will have to disagree about the comments on Dr.Sunny’s character. He has both funny and a serious note in his behaviour. Shobhana had done absolute justice to her role and as a dancer she is just brilliant. One important thing which made the character more impactful was the excellent dubbing provided by two famous dubbing artists – Bhagyalakshmi for Shobana’s Ganga portion, Nagavally’s portion by Jayageetha. They had played an important role in making Ganga/Nagavalli alive even after 20 years of making the movie. i like your review but if you don’t understand malayalam you may find some comedy scenes a bit irritating. that ‘s not your fault because comedy will loose its fun when it gets translated.and some people may not like comedy scenes in serious films.mohan lal is a great actor,in malayalam he is a superstar but this movie is well known as shobhana’s movie and the entire crew of the movie done a great job.i have watched its remakes and like you said they are all scraps.i am a malayalee so i really enjoy the movie whenever it telecasts in TV. Thanks for your comment & good to hear you liked the review. Comedy is one of the hardest things to get in another culture, and it never translates well. Having to read subtitles just makes another barrier to ‘getting it’, and I’m not a fan of slap-stick in any language! 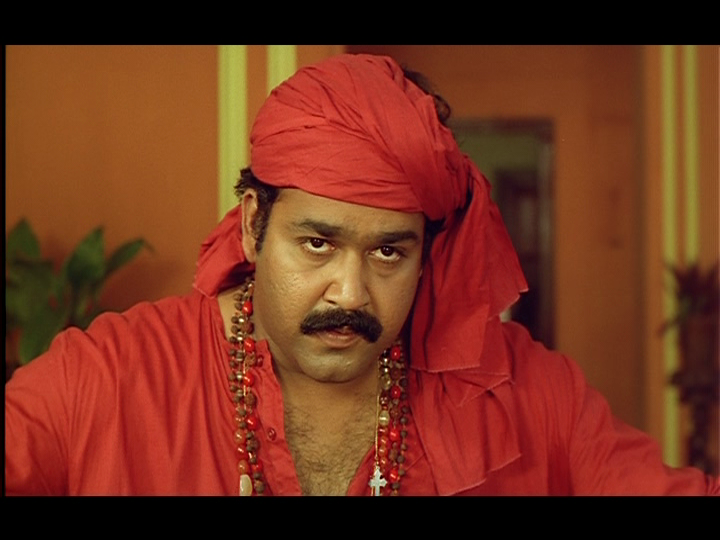 However I still love the film and could tolerate Mohanlal much better in this than Akshay Kumar in Bhool Bhulaiyaa! Add me, a Malayalee, to the number of people (probably miniscule) who found Mohanlal *very* irritating in his Dr Sunny Joseoh incarnation! And he’s such a fantastic actor too. But it is a classic and deserves to be known better than it is. I wish there was a really good sub-titled versiont that can be shown to people who do not understand the language. The remakes in the other languages never came close to achieving this one’s simplicity. It’s still my favourite version of the story as Shobana is just amazing as Ganga – and I just endure the ‘comedy’ and remind myself about how much I love Mohanlal in many other films! Good to know it’s not just an Irish vs Indian idea of comedy issue too! Thanks for the information about the casting. Interesting reasoning. I really enjoyed reading your review. I agree with your comment that Mohanlal was a bit annoying when he tried to be comical. Maybe he was trying to calm things down as this movie is a disturbing movie in some ways. Overall its the best Malayalam movie ever. Welcome to the small (or perhaps exclusive 😛 ) group of people who didn’t completely enjoy Mohanlal’s character! it’s hard to find the best movie ever came in Malayalam….but if u look at almost all online polls, Manichitrathazhu bags no.1 spot……….it is still fresh even after 20 years and all these remakes… As Heather correctly pointed out, comedy is hard to get translated…. It’s still one of my favourites! Shobana is incredible and I think her performance is the main factor in my love for the film. It was watching the song Oru murai vanthu pattaya that inspired me to watch the film initially and she is just mesmerising throughout. good review! I saw many disagree with your view about replacing Mohanlal vth rajnikanth, well definitely Mohanlal is the most versatile actor and I think that you want Rajni character than Mohanlal frolicfull character instead of replacing actors. May be so! I never get bored while watching this epic movie that to for umpteen times. Remakes were all kinda mockery to this epic!. if you want to know definition of versatile watch all Mohanlal film especially of 80s & 90s. Watch Kireedom.Vanaprasthanam,Thanmatra,Bhramaram,Bharatham & Guru. Also Shobana ma’am showcased a do or die kinda act. Though it has few loopholes still its an age-defying classic. Thanks for your comment. I love rewatching this film although I do now skip over the bits I find annoying. It’s an absolute classic! when you criticize the character of Dr. sunny , you should remember two things. First, mohanlal like any other actor,is a tool in the hands of the director.he has done what the director had asked him to perform.and he has done it brilliantly.if you look in Lal’s filmography,there is no dearth of serious characters done by him in mainstream cinema .examples like ‘ kireedom, chenkol,sadayam etc immediately comes to mind. And for your information he has also done the role of a serious psychiatrist in ,ulladakkom directed by kamal,in which he treats the mentally ill character of actress Amala.incidentally shobhana played his love interest in the film.so you can’t blame mohanlal if you felt his character was overblown. Secondly manichithrathazhu was intended as a mainstream film primarily to make good PROFIT.to leave out the comedy would have made it a wearisome watch and it would not have become the huge hit it is. This is just my viewpoint. I am sorry if I have offended you in any way. Thanks for your comment. Absolutely the character of Dr Sunny is down to the writer and the director, but I still didn’t like the way the comedy was used. It’s not just Mohanlal either as I have the same problem with the character in both the Tamil and Hindi versions with Rajinikanth and Akshay Kumar in the role. I still love the film, so it’s not that it’s a major issue for me, but I found some of the jokes inappropriate. That’s just my opinion though and as you can see from the comments plenty of people have a different view. I think that it’s great that other people have different views and reading other people’s opinions sometimes does make me think of things in a different way. Manichithrathazhu is at the top of my all time fav movies and I’m a big fan of both Shobana’s and Mohanlal’s performance in it and hence found your view on Dr. Sunny’s characterisation very odd. The character was written in this way because, if Dr. Sunny was a serious guy then the secret that shobhana was the mental patient would get disclosed very early in the film. Thanks for your comment. I think comedy is one of the hardest things to translate and this just didn’t appeal to me. I take your point about the plot, and it’s not that I mind comedy per se but the style of slap-stick comedy employed here just isn’t funny for me. I still think it’s a fantastic film though! This is indeed a good review on the classic movie Manichithrathazhu.. It is completely a “Shobana” movie where the heroine is Shobana’s character “Ganga” and the hero is the “Script”. I find Mohanlal’s character not that odd. May b u felt it odd because it is difficult to translate comedy scenes or understand comedy scenes in other language. Not only Shobana;s dance but her acting is also superb, out of the world, in this movie. Good review and i must say itz a great to see you replying for the comments, continuing it for many years for this film.. I firstly want to point out that Unnithan is not Thambi’s brother, but , is his brother-in-law. More clearly, Unnithan is the husband of Bhasura, who is Thampi’s sister. And, even as a Malayali, I too agree with your comment that Mohanlal was a bit or more annoying when he tried to be funny. I too watched the remakes of the film in Tamil, Kannada, and Hindi. From my point of view, I feel that Shobhana and Jyothika were nice and I liked acting of both of them equally. But, Soundarya and Vidya Balan was not appealing for me. Dr.Vishnuvardhan was the most disgusting element in the Kannada version. Soundarya was not that nice in the scene where she lifts the bed. Deeply discussing, I’m not completely satisfied with any of these films. Even Malayalam version has some flaws. The scene where a pot of water, the plates and the clock breaks , does not seem realistic to me. Anyway, I love watching Manichitrathazhu and Chandramukhi more and more. Hope no one have hard feelings!!! Also nice to know it’s not just me after all who found some of the comedy annoying! Most people disagree I know, but the comedy in this film (any version!) just doesn’t work for me. malayalam comedies which are subtle and which originates from its culture and lifestyles. hope to see you with more reviews on other well made movies keeping in mind above mentioned facts. shobana is the heroine of film and hero is the story itself, Mohanlal is just a supporting actor, he was portrayed so, that may be the reason you dont like mohanlal. In tamil and telugu versions, the hero was doctor himself, and no importance was given to story. 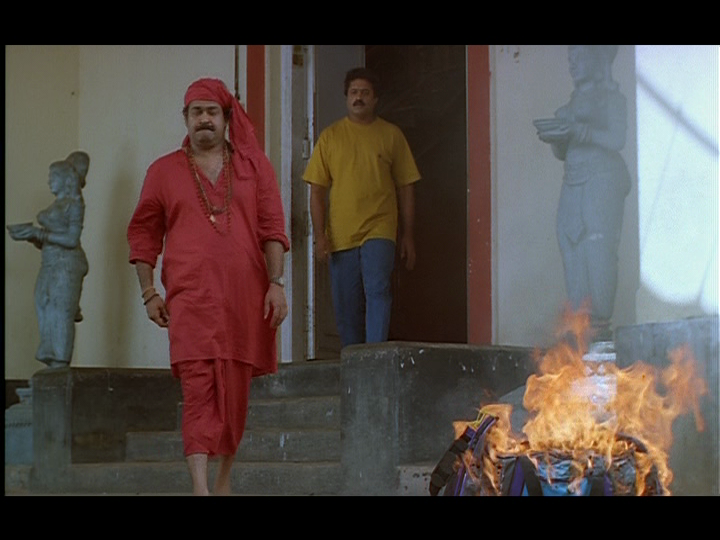 Chandramukhi only showcased rajnikanth style. Happy to see a review about this movie, and that too by a non malayalee,awesome..
By reading the comments, most of the malayalees have disagreed ur review about dr.sunny, cant complain, because we malayalees cant even imagine dr.sunny’s character in any other way or being done by any other actor.i remember watching this movie in theatre, and people enjoyed each and every joke in this movie, and mohan lal’s performance as both comedy and serious shade in this movie was well appreciated, and we used to use the comedy dialoges of mohan lal in our real lifes( like “kindi” and “vellam vellam”). But i respect your review and i can only say, i wish you were a malayalee to change your opinion about mohanlal and enjoy the comedy.. I do really like Mohanlal – just not his character here 🙂 but it’s a general dislike of the character in all versions of this story as the humour just doesn’t work well for me. Even worse is Akshay Kumar in the Hindi version! 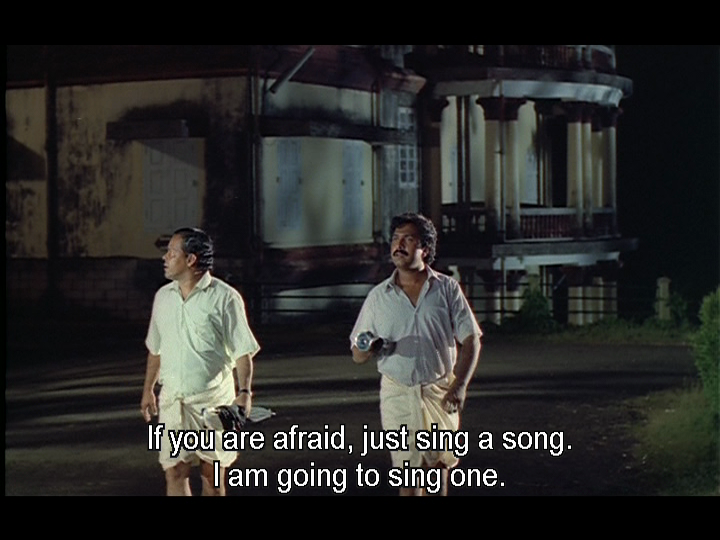 I love this film though – still one of my favourite Malayalam movies and Shobana is just amazing. Thank you for your link to your interesting and very detailed review of the film 🙂 You’ve really thought about the different character motivations and have given me a different perspective on the role of Dr Sunny. The comedy was still too OTT for me, but I do like that you’ve reasoned through the characters motivations and thought processes which make it possible that there was an actual treatment plan there! Rajinikanth in place of mohanlal,thts the dumbest thing i heard ths summer mam.i too find mohanlal character too odd nd wont seem to be worked out for adults but neither akshay nor rajini can do any better than him,perhaps u couldn hav said tht the character should hav been different . With all respect do u think rajini is better than mohanlal? You telling me to change my mind because your opinion is a fact? THAT’s the dumbest thing I’ve heard this week. Dont agree with the comments by “Temple” .. I have seen the Tamil version and it was nasty… couldn’t tolerate Rajinikanth antics..more focussed on Rajini heroics like general tamil movies..